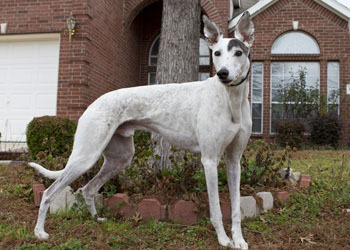 Ralph, formerly Fate, aka About Fate, is a handsome, 7-year-old white and brindle male born March 15, 2005. His sire is the Irish bred Larking About, and his dam is Winks Willow, making his grand-sire the late famous Molotov. Ralph’s racing career of 116 races started at Dubuque in Iowa on September 9, 2006, moving to Valley Race Park in Harlingen, TX, then back to Dubuque and finally ending on February 27, 2009. He was in a home for two years, but has since returned to GALT. He's ready to begin his search for a forever home once more! Ralph needs to have canine companionship. Ralph’s cat test: Ralph is not considered cat tolerant. He had a one-track mind to get the cat from the get-go. 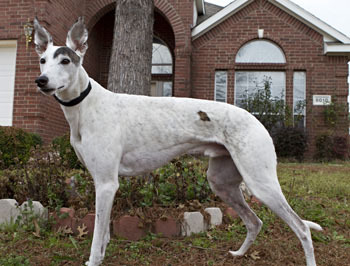 If you have toys that need playing with, Ralph is your greyhound! He likes to collect them, shake them, toss them, squeak them, and sometimes loves them to death. Ralph likes car rides and walks too, but toys are king with him. 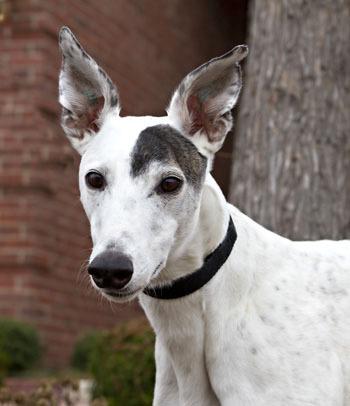 Ralph thrives when he has other dogs around, and he currently lives peacefully with several other greyhounds and a sheltie. Ralph has great manners in the house, aside from an urge to get up on the sofa. But he will get down when we tell him to, albeit with a look of pitiful suffering in hopes that we'll relent. This goregous boy would love to snuggle on your sofa if you'd let him!